Bed Bug Exterminator Seattle: Why Have They Made A Comeback? Why Have Bed Bugs Made A Horrifying Comeback? For over 60 years, Americans believed they’d banished the bed bug forever. Unfortunately, they were wrong, and bed bugs are back with a horrifying vengeance. As bed bug exterminators in Seattle, we’ve seen our fair share of absolutely awful infestations, and we’re here today to talk about why they’ve made such a strong comeback. Bed bugs were a normal part of American life for years in the early 1900s. By 1926, infestations in apartments and hotels across America were so common that experts could not remember a time when they weren’t a problem. While people obviously hated being bitten on a nightly basis by these pesky bloodsuckers hiding in mattresses, they simply seemed impossible to eradicate. Everything changed in 1939 when Swiss chemist Paul Hermann Muller discovered the now infamous pesticide, DDT, which proved incredibly effective at killing insects, especially bed bugs. For decades after this discovery, DDT and other pesticides and chemicals kept America’s bed bug problem at bay. The glory days of bed bug-free homes and hotels ended when a new strain of pesticide-resistant bed bugs popped up in 2000. The horror! In 2009, there were 11,000 complaints reported in New York City alone. Many residents didn’t realize anything was amiss until they woke up in the morning with strange bites and rashes. By then, their unwelcomed guests had already settled in and made themselves at home. That’s right. Bed bugs have evolved and are now resistant to the once cure-all pesticide, DDT. That doesn’t mean that you’re out of luck, though. 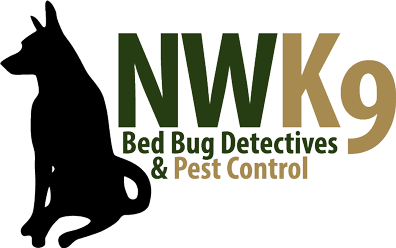 If you’re experiencing a bed bug infestation, call the bed bug exterminators in Seattle at Northwest K9 Bed Bug Detectives today. We’re here to help.